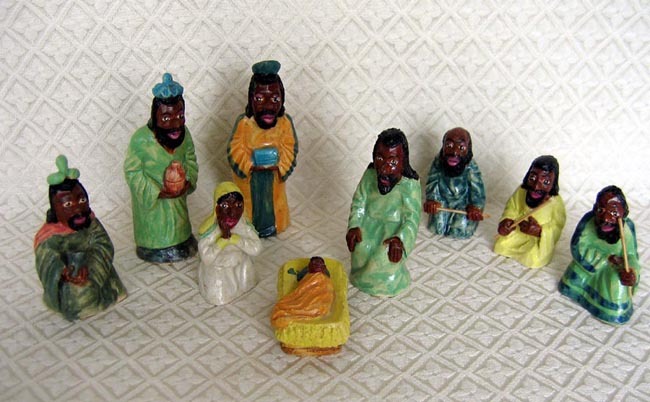 This painted clay Nativity set was handcrafted in Dedza, Malawi. Dedza is the highest town in Malawi; pine-covered Dedza Mountain, reaching up to nearly 7,000 feet, forms the backdrop for the pottery workshop. The workshop began in 1987 and now employs over 270 permanent members. The potters find and prepare nearly all their raw materials locally, and much of the production is fired in kilns that burn the pine waste sawdust from the local sawmill. The set contains 12 pieces: Joseph, Mary, Baby Jesus, three shepherds, a cow, a donkey, a sheep, and three wise men. The tallest wise man stands 4.5 inches tall.